SALINAS, Calif. – Oct. 18, 2016 – Tom and Steve Church, chairman of the board and CEO of Church Brothers Farms respectively, received the Produce Marketers for All Seasons award from The Packer at the Produce Marketing Association’s annual Fresh Summit meeting in Orlando, Fla.
Church Brothers Farms, based in Salinas, Calif., is a vertically integrated, multi-family owned and operated company that farms in California, Arizona and Central Mexico and produces hundreds of fresh vegetable products. 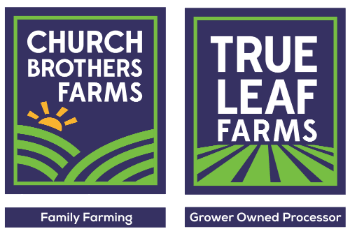 The company has an in-house farming/harvest program and state of the art processing plant, True Leaf Farms, in San Juan Bautista. In presenting the award, the Packer staff said the Church family is an institution in Salinas Valley agriculture due to the legacy of service and innovation that Tom and Steve Church have demonstrated for more than 45 years. Tom has three sons; two are working owners in Church Brothers Farms, Jeff Church is vice president of sales and Brian Church is vice president of production. Steve’s son, Chuck Church, works in the marketing department and his step-daughter, Megan Chedwick, is director of food safety and sustainability. Tom has been involved with several community organizations including the Salinas Valley Memorial Hospital, Center for Produce Safety, TALC, Boy Scouts and Rancho Cielo. He received The Packer Magazine’s Foodservice Achievement award in 2014. Steve is past chairman of the Grower Shipper Association of Central California and served on the Board of Directors for the Western Growers Association, the California Leafy Greens Marketing Agreement and Central California Lettuce Producers Co-op.